Blogging: It's not just for professionals anymore. It's for future professionals (students) too! ​It's just not enough to tell a student to create a portfolio because we, as teachers and administrators, say so. To what end? And how can the portfolio become a useful tool that will help connect students with professionals, showcase their growth over time, create spaces for students to teach other students, and provide a place for students to get clear about what worked and didn't work in their learning? If a more traditional brochure portfolio is really only seen by a select few, what would happen if we added the connectivity of social media and blogging into the mix? ​How do we harness the power of blogging to get students jobs, create authentic writing tasks, and strengthen our learning community? Out in the workforce, when one applies for a job nowadays, there is consistently a request for a website link to show information about the applicant and the path they have traveled to get to the present. Are we responsibly preparing students for future careers if we ask for a traditional portfolio, or is it time to move closer to how the real world currently operates? After listening to staff, students, parents and other stakeholders, we decided in 2015 that it was time to rethink our school portfolio, a graduation requirement at New Technology High School. I, along with another staff member, Andrew Biggs, led a team of twelve student volunteers. Through the Design Thinking Process, our team gathered feedback from all stakeholders involved, reviewed website platforms, created prototypes, sought feedback during each iteration, and arrived at a more user-friendly, flexible, and yet powerful way for students to document, teach and connect with others through blogging. 2015 was our soft rollout of the new portfolio and 11 and 12th graders were given the option of switching to the new format, or continuing toward completion of a more traditional brochure website portfolio. 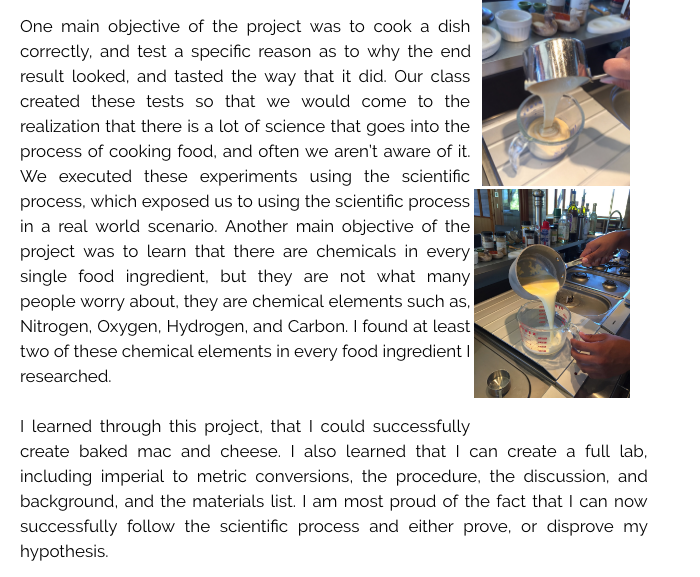 Students who were complete or nearly complete took the option to finish and be done with portfolio, but surprisingly, many opted for the new format, because they were interested in blogging about their own interests. 9th and 10th graders were asked to begin setting up a blog portfolio with this format with the idea that if the format was simple, it could remain flexible to the needs of both the students and the teachers. Out of 408 students at New Technology High School, we have moved from a total of about 80 students with traditional portfolios completed by the time of graduation, to a total of over 320 students actively blogging as a part of their everyday learning. Students are writing blogs that document, teach and show reflection of learning in all classes, Math, Science, Art, History and Language Arts. Blog posts are categorized according to the School Wide Learning Outcomes at New Tech. There are strategies in place to make sure that those who still do not have a blog created will get extra support to do so in the coming months through our Advisory class. There are also steps in place to continuing to teach what an effective blog looks like, as well as time to work on concepts during Advisory. ​One student’s post was retweeted by an administrator at Vintage High, which then allowed for 300 views of her blog post in one day. It gained exposure for both the student and the school. Another student wrote a post about a certain technical tool on Adobe Illustrator during class. The teacher Facebooked the post and after reading it, a professional in that field left an encouraging comment for the student. Another example of how many visitors a student can have after being promoted on social media. This student got close to 300 views over a four day period. Within the walls of the school, students have shared blog posts on how to get along with teammates, how to create great copy for blogs, how to use technical tools, what their learning process taught them and how others can benefit. These blog links are featured regularly in the weekly school bulletin. Teachers are sharing links to certain blogs that address need-to-knows and we have expanded our sources for new learning material at New Tech, taking greater advantage of the “experts in the room” and including students in that group as experts in their own right. Interestingly enough, I was able to harness the power of blogging to get my work seen before a wider audience. Before choosing this capstone project that focuses on Educational Blogging, I had written an Action Research paper about The Effect of Digital Tools on Reading Comprehension, Focus and Engagement. Because I have worked hard to create a digital presence in my teaching life over the last several years, I shared my Action Research paper with my PLN (Professional Learning Network) through my Twitter account. As a result, the VP of Marketing at Nearpod (the digital tool that I tested in my study) heard about my work. 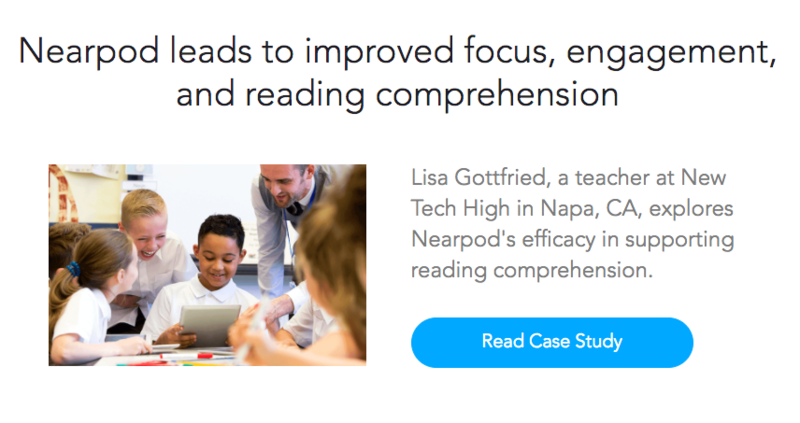 After speaking with the executives at the company about my work, I was then asked to provide the paper to Nearpod for their own online case study section of their online application. I know that by participating in the greater education community through blogging, that I have deepened the ability for other educators to use the digital tool in a meaningful way in their classrooms. I have also been invited to become a PioNEAR for their program, running workshops to show other educators who to use Nearpod how to increase focus, comprehension and engagement in learning. It is not enough to educate ourselves, our instructor and our cohorts, but to think beyond that small group to a much wider audience. I am less interested in pleasing a professor, than I am in making a larger difference by sharing my knowledge with others. Blogging has allowed me to do that. So, although it seems as though my capstone project and my Action Research study are unrelated, nothing could be farther from the truth. I want these same things to happen for my students, opening new opportunities, engaging in online learning communities and getting students in front of a wider audience so they can truly become, not just a participant in the 21st Century leaders in that world.